Purpose: To investigate the efficacy and safety of saffron in the treatment of major depressive disorder (MDD) in comparison to placebo and synthetic antidepressants. Patients and methods: We conducted a systematic search in several electronic databases as well as manual search in bibliographies of relevant studies. We included randomized controlled trials that investigated the efficacy and safety of saffron for treating MDD in adults in comparison to either placebo or synthetic antidepressants. Primary outcome was change in scores on depressive symptoms from baseline. Secondary outcomes included remission rate, response rate, and drop-out rate for all reasons. We chose a random-effects model in order to obtain more conservative results. Standardized mean differences (SMDs) and odds ratios (ORs) with 95% confidence intervals (CIs) were estimated as the overall effect index by inverse variance models. Results: Seven studies were included in this meta-analysis. Overall quality of these included studies was moderate. As for the primary outcome, saffron showed more improvements in depression symptoms when compared with placebo, with an SMD of -1.22 (95% CI -1.94, -0.49, P=0.001). Meanwhile, saffron was as effective as synthetic antidepressants, with an SMD of 0.16 (95% CI -0.25, 0.57, P=0.44). Moderate heterogeneity existed in our analysis. Through subgroup analyses, we found that treatment dosage and duration, types of synthetic antidepressants administered in the comparison group, and outcome measures could explain most of the variance. No differences were found in remission rate, response rate, or drop-out rate. Conclusion: Saffron was effective in the treatment of MDD and had comparable efficacy to synthetic antidepressants. Saffron was also a safe drug without serious adverse events reported. Depression is a common and serious mental disorder, with more than 300 million people affected worldwide.1 It has been reported that depressive disorders have a 12-month prevalence of about 6%–8% and a lifetime prevalence of ~10%–15%.2–5 Major depressive disorder (MDD) could result in social disability, higher risk of both psychiatric and physical comorbidities, and even suicide.1,6,7 Since the first introduction of synthetic antidepressants, pharmacological therapy had played an important role in the treatment of depression, especially for outpatients. Synthetic antidepressants, such as selective serotonin reuptake inhibitors (SSRIs), serotonin noradrenaline reuptake inhibitors, monoamine oxidase inhibitors and tricyclic antidepressants (TCAs), are effective in improving depressive symptoms, but one-third of the depressed patients will not respond to first-line treatment with synthetic antidepressants.8,9 Also, most depressed patients cannot tolerate side effects of synthetic antidepressants, like anxiety, nausea, constipation, anticholinergic effects, arrhythmias, and sexual dysfunction.10,11 Therefore, we need to find new therapies for MDD. Crocus sativus L., also known as saffron, is a southwest Asian plant which belongs to the Iridaceae family. Commercial saffron is the dried stigma of C. sativus L. and has been the most expensive spice and dye in the world.12 It contains four main active constituents: crocin and crocetin, which are responsible for saffron’s coloring properties; picrocrocin, which gives saffron its bitter taste; and safranal, which provides saffron its characteristic odor.13,14 Apart from its value as a food additive and dye material, saffron is also an effective herbal medicine. It has shown several useful pharmacological effects such as anticonvulsant, anti-inflammatory, antitumor, radical scavenger effects, learning and memory improving effects, etc.13,15 In traditional medicine, saffron is also used in the treatment of depression.16–18 However, exact mechanisms of saffron for modulating mood have not been recognized. Several studies indicated the underlying mechanisms involved in the antidepressant effects of saffron. Animal studies showed that saffron constituents could elevate the levels of serotonin, dopamine, and norepinephrine by inhibiting reuptake of these substances in synapse.19–21 De Monte et al also showed the inhibitory activities against monoamine oxidases of saffron.22 Several studies have shown that saffron’s antidepressant effects are potentially due to its serotonergic, anti-inflammatory, neuroendocrine, and neuroprotective effects.23–26 Nonetheless, these suggested mechanisms need more studies to confirm the results. In 2016, clinical guidelines by the Canadian Network for Mood and Anxiety Treatments recommended saffron as a third-line adjunctive therapy for mild to moderate depression among complementary medicines.27 Recently, more studies on efficacy and safety of saffron for treating MDD have emerged. However, the results were controversial. Therefore, this meta-analysis was designed to provide evidence on efficacy and safety of saffron for treating MDD in adults. All records were searched through the following electronic databases: PubMed, Embase, Cochrane Library, Web of Science, and websites of ClinicalTrials.gov from their inception up to September 20, 2017. Bibliographies of relevant studies were also hand searched. Keywords employed in this analysis were “saffron”, “crocus”, “crocus sativus”, “depression”, “depressive”, “mood disorder”, and “affective disorder”. No restrictions were made in language, publication date, or publication status. We included double-blind randomized controlled trials (RCTs) that investigated efficacy and safety of saffron for treating MDD in adults, comparing to either placebo or synthetic antidepressants. MDD should be diagnosed based on standardized diagnostic criteria, such as Diagnostic and Statistical Manual of Mental Disorders (DSM)28–32 or International Classification of Diseases.33,34 Only an oral monotherapy was administered to participants in either the saffron group or comparison group. In this analysis, we excluded trials on depression secondary to physical diseases and trials on child and adolescents’ depression. Trials without adequate data, trials with quasi-random, or trials with small sample size (less than 10) were also excluded. If two trials had overlapping populations or duplicated data, we excluded the trial with less information. Two investigators independently screened all the records based on the abovementioned inclusion and exclusion criteria. Two investigators independently extracted data from the included trials based on a predetermined list for data to be extracted. The list included the following items: the first author, publication year, study country, study design, single center or multi-center, sampling sites and time, sample size, age, percentage of females, type of depression, severity of depression at baseline, diagnostic criteria, intervention and comparison medications, dosage and duration of intervention, outcome measures, baseline data, post-treatment data or change from baseline, number of dropouts for all reasons, and adverse events. One investigator would e-mail the authors when encountering incomplete data. Discrepancies were resolved by discussion and then a consensus was reached. 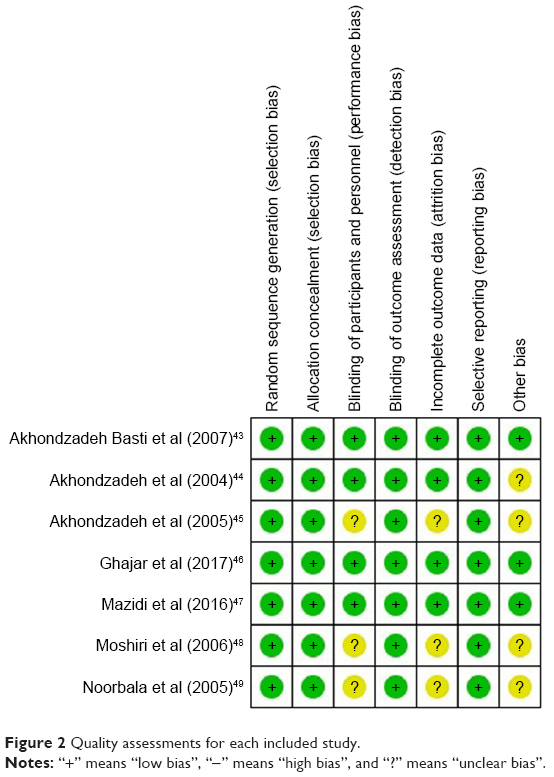 Two investigators assessed the quality of each included study by the Cochrane Collaboration’s risk-of-bias method, independently.35 This method is composed of six domains (random sequence generation, allocation concealment, blinding of participants and personnel and blinding of outcome assessment, incomplete outcome data, selective reporting, other bias), and each domain would be rated as “low”, “high”, or “unclear” bias. In this analysis, the primary outcome was defined as the mean overall change of depressive symptoms from baseline to end point. Improvement of depressive symptoms was usually quantified by clinician-rated scales, such as Hamilton Depression Rating Scale (HAMD), and self-rated scales, such as Beck Depression Inventory (BDI). For instance, HAMD-17 scores <17, 17–24, and >24 were considered as mild, moderate, and severe depression, respectively.36 BDI scores <19, 19–29, and >29 were considered as mild, moderate, and severe depression, respectively.37 In cases where the same study reported different scales, we prioritized clinician-rated scales, and then the self-rated report.38 Secondary outcomes for efficacy included remission rate (defined as the proportion of patients with HAMD scores <7 at end point) and response rate (defined as the proportion of patients with a 50% or more reduction in HAMD scores from baseline to end point). In addition, number of dropouts for all reasons was also included as one of the secondary outcomes. RevMan5 software (Cochrane Information Management System) was used to perform this meta-analysis. When standard deviation (SD) was not provided in an article and the authors could not be contacted, an estimated SD would be calculated from the reported P-values, confidence intervals (CIs), or standard errors (SEs) in that article.39 We chose a random-effects model in order to obtain more conservative results. Standardized mean differences (SMDs) with 95% CIs were estimated as the overall effect index for continuous measures (the change scores on HAMD or BDI), and the odds ratios (ORs) with 95% CIs for dichotomous measures (the number of patients under remission and response, and the number of dropouts for all reasons) by inverse variance models. Possible heterogeneity across the included studies was evaluated by the test of inconsistency (I2). When I2-statistic was higher than 50%, it was considered that moderate to large heterogeneity existed between the studies.40 Then, subgroup analyses were conducted to find the sources of heterogeneity. With respect to publication bias, all included studies were assessed by Egger’s test using STATA 12.0 statistical software.41 The two-sided P-value <0.05 was considered to be statistically significant. Comparison between saffron and antidepressants or between saffron and placebo was analyzed respectively. 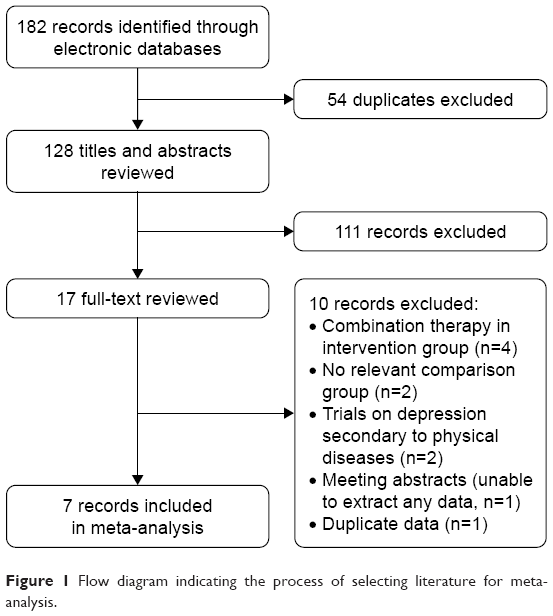 Figure 1 Flow diagram indicating the process of selecting literature for meta-analysis. A summary of the risk of bias of the seven included studies is shown in Figure 2. None of the six domains in our quality assessment method was rated as “high bias”. All of the studies were conducted well and rated as “low bias” in random sequence generation, allocation concealment, binding of outcome assessment, and selective reporting. Three studies were unclear in blinding of participants and personnel, with incomplete outcome data, because they had no description on randomization method or did not report reasons for withdrawal.45,48,49 Baseline information in four studies was too small to assess if other bias existed.44,45,48,49 In general, quality of the included studies was moderate. Figure 2 Quality assessments for each included study. Notes: “+” means “low bias”, “−” means “high bias”, and “?” means “unclear bias”. The characteristics of included studies are summarized in Table 1. All of the studies were conducted in Iran, a country that produces 90% of the saffron in the world, and most participants (60.1%, 190/316) were recruited from the clinics of Roozbeh Psychiatric Hospital. Study design included parallel RCTs, three of which compared with placebo45,47,48 and four of which compared with synthetic antidepressants.43,44,46,49 Sample size ranged from 30 to 66 participants with a mean age of 37.1 years (range 34.0–43.2 years). Diagnoses of all the MDD cases were made through DSM-IV or DSM-V, with comorbid anxiety in two trials.46,47 Most trials (n=6 studies) administered saffron at a dose of 30 mg/day, whereas treatment duration varied from 6 weeks to 12 weeks with a mean of 7 weeks. Six trials employed HAMD to evaluate improvements in depression symptoms and one trial employed BDI.47 The trials were uniform in severity of MDD, all of which recruited just mild to moderate depression cases according to HAMD scores or BDI scores. Note: aThe number of patients who were assigned randomly. Abbreviations: BDI, Beck Depression Inventory; DSM, Diagnostic and Statistical Manual of Mental Disorders; HAMD, Hamilton Depression Rating Scale; MDD, major depressive disorder; RCT, randomized controlled trial. Summary of the effect sizes of primary outcomes is presented in Figure 3. In our analysis, saffron showed more improvement in depression symptoms when compared with placebo, with an SMD of –1.22 (95% CI –1.94, –0.49, P=0.001; n=3 studies).45,47,48 Meanwhile, saffron was as effective as synthetic antidepressants, with an SMD of 0.16 (95% CI −0.25, 0.57, P=0.44; n=4 studies).43,44,46,49 However, mild to high heterogeneity existed between studies, with an I2 of 70% for studies compared with placebo and an I2 of 42% for studies compared with synthetic antidepressants. We tried to find possible sources of heterogeneity through subgroup analyses stratified by treatment dosage, treatment duration, types of synthetic antidepressants, and outcome measures. One of the three studies that compared saffron with placebo was very different from the other two in the abovementioned stratification factors.47 Patients in that study received saffron at a dose of 100 mg/day for 12 weeks, not 30 mg/day for 6 weeks as in the other two studies, and it evaluated improvements in depression symptoms by BDI, not HAMD. When performing a subgroup analysis, we found 84.4% of variance could be explained by the abovementioned factors (Figure 4A). However, saffron was still more effective than placebo in either of the subgroups. Heterogeneity in studies comparing with synthetic antidepressants was mainly caused by different types of synthetic antidepressants administered in comparison groups, which could explain 78.6% of variance (Figure 4B). Similarly, saffron had comparable antidepressant effects when compared to either the TCAs group or SSRIs group. No publication bias existed in either of the two outcomes (P=0.068 and P=0.541, respectively). 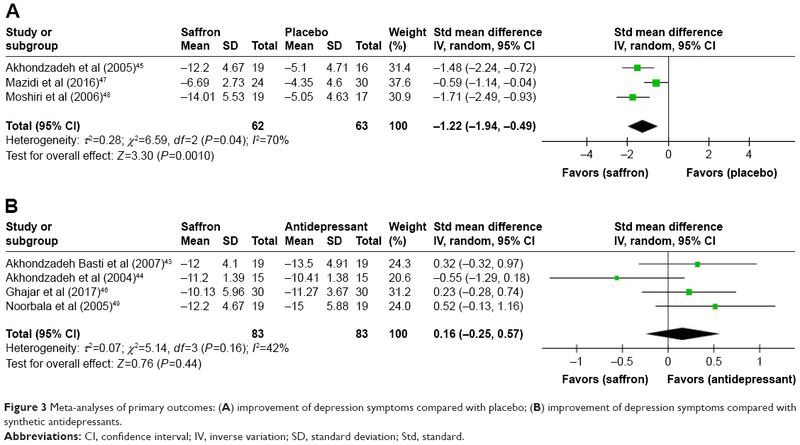 Figure 3 Meta-analyses of primary outcomes: (A) improvement of depression symptoms compared with placebo; (B) improvement of depression symptoms compared with synthetic antidepressants. Abbreviations: CI, confidence interval; IV, inverse variation; SD, standard deviation; Std, standard. Figure 4 Results for subgroup analyses of primary outcomes: (A) subgroup analysis in studies compared with placebo, stratified by treatment dosage, duration, and outcome measures; (B) subgroup analysis in studies compared with synthetic antidepressants, stratified by type of antidepressants. Abbreviations: BDI, Beck Depression Inventory; CI, confidence interval; HAMD, Hamilton Depression Rating Scale; IV, inverse variation; SD, standard deviation; SSRIs, selective serotonin reuptake inhibitors; Std, standard; TCAs, tricyclic antidepressants. Meta-analyses results for secondary outcomes are presented in Table 2. Remission rate and response rate were only reported in two studies that compared saffron with synthetic antidepressants.43,46 Results of these two outcomes indicated that saffron showed identical effects in the remission of MDD (OR=0.54, 95% CI 0.21, 1.41, P=0.21) and patients responded to saffron in the same manner as to synthetic antidepressants (OR=0.47, 95% CI 0.19, 1.19, P=0.11). No difference was found in the drop-out rate compared with either placebo (OR=0.87, 95% CI 0.07, 10.64, P=0.91) or synthetic antidepressants (OR=1.00, 95% CI 0.28, 3.63, P=1.00). Abbreviations: CI, confidence interval; SMD, standardized mean difference. Our study suggested that saffron was effective in the treatment of mild to moderate depression and had similar antidepressant efficacy as compared to synthetic antidepressants. The results in this meta-analysis are in line with the previously published meta-analysis by Hausenblas et al, which also investigated the effects of saffron for treating MDD.50 However, the number of included studies and total sample size were larger in our analysis. Therefore, our results tended to be more robust compared with Hausenblas et al.50 Currently, cognitive behavioral therapy (CBT) is recommended as the first-line treatment for mild to moderate depression.27 A meta-analysis by Okumura and Ichikura reported a pooled SMD of −0.68 when comparing the efficacy of group CBT to non-active controls, which was far less effective than saffron in this analysis.51 Meanwhile, clinical practice of CBT is always limited by few trained therapists and noncompliance. Thus, saffron may be considered as an alternative therapy for MDD. However, commercial saffron is very expensive, which limits its application in medicine. One study in this analysis compared the efficacy of the petal of C. sativus L. to placebo, and the results indicated antidepressant efficacy for the petal of C. sativus L.48 Recently, a few studies found that the petal had effects similar to that of commercial saffron, which is the dried stigma of C. sativus L., whereas the petal was much cheaper compared to saffron (specifically refers to the stigma of C. sativus L.).52 Therefore, the petal of C. sativus L. may provide us with an opportunity for widespread use of saffron in the field of medicine. In this analysis, administration of saffron did not increase the risk of adverse events when compared with either placebo or synthetic antidepressants; saffron is a generally safe drug. Actually, a small number of adverse events, such as changed appetite (18.6%), including both decreased and increased appetite, anxiety (12.4%), headache (11.0%), and nausea (11.0%), were reported in patients receiving saffron. A previous study evaluated safety of one of the major saffron constituents, crocin, in healthy volunteers.53 It did not report any serious adverse events. However, we noted that two of our included studies enrolled depressed patients who also had anxiety,46,47 and one of these studies reported a great relief from anxious mood as assessed by BDI.47 This was contrary to the high rate of anxiety induced by saffron in other studies. Also, saffron was found to improve sexual dysfunction associated with SSRIs.54–56 However, Akhondzadeh Basti et al reported three cases of sexual dysfunction after taking saffron.43 As only a small number of studies with short-term duration are available, more well-designed studies on safety of saffron with a longer duration are recommended. There were limitations in this meta-analysis. Firstly, the small number of studies and overall sample size could limit the strength of our conclusions and it was impossible to perform a full subgroup analysis. Secondly, research settings were unitary as all the included studies were conducted in Iran and mostly from the same group of investigators. Therefore, some of the patients in the studies may be “recycled”, ie, studies may have included some of the same patients who were included in other studies. Thirdly, similar mean age and proportion of males and females between studies made it difficult to analyze the efficacy of saffron in different age groups and the efficacy difference between males and females. In addition, results in this meta-analysis may be hard to extend to other population groups. Finally, incomplete demographic information may bring about uncertain bias in this analysis. In the future, more high-quality studies on efficacy and safety of saffron with long-term follow-up are needed. Studies could be focused on the petal of C. sativus L., since it is much cheaper than saffron. In summary, saffron was effective for treating MDD and had comparable efficacy to synthetic antidepressants. It could be considered as an alternative to CBT or synthetic antidepressants in the treatment of mild to moderate depression. Saffron was also a safe drug, not causing serious adverse events. However, well-designed, larger scale studies from different ethnic groups and with long-term follow-up are needed. It is recommended that more studies focus on the petal of C. sativus L.. Since saffron is a mixture of various compounds and the active moiety (ies) is not clear, it is considered that each component might contribute to the documented effects, but further exploration is required. World Health Organization. Depression. 2016. Available from: http://www.who.int/mediacentre/factsheets/fs369/en/. Accessed November 25, 2016. Ayuso-Mateos JL, Vazquez-Barquero JL, Dowrick C, et al. Depressive disorders in Europe: prevalence figures from the ODIN study. Br J Psychiatry. 2001;179:308–316. Bourdon KH, Rae DS, Locke BZ, Narrow WE, Regier DA. Estimating the prevalence of mental disorders in U.S. adults from the Epidemiologic Catchment Area Survey. Public Health Rep. 1992;107(6):663–668. Kessler RC, McGonagle KA, Zhao S, et al. Lifetime and 12-month prevalence of DSM-III-R psychiatric disorders in the United States. Results from the National Comorbidity Survey. Arch Gen Psychiatry. 1994;51(1):8–19. Chisholm D, Diehr P, Knapp M, Patrick D, Treglia M, Simon G. Depression status, medical comorbidity and resource costs. Evidence from an international study of major depression in primary care (LIDO). Br J Psychiatry. 2003;183:121–131. Kozela M, Bobak M, Besala A, et al. The association of depressive symptoms with cardiovascular and all-cause mortality in Central and Eastern Europe: prospective results of the HAPIEE study. Eur J Prev Cardiol. 2016;23(17):1839–1847. Sinyor M, Schaffer A, Levitt A. The sequenced treatment alternatives to relieve depression (STAR*D) trial: a review. Can J Psychiatry. 2010;55(3):126–135. Berlim MT, Fleck MP, Turecki G. Current trends in the assessment and somatic treatment of resistant/refractory major depression: an overview. Ann Med. 2008;40(2):149–159. Cascade E, Kalali AH, Kennedy SH. Real-world data on SSRI antidepressant side effects. Psychiatry (Edgmont). 2009;6(2):16–18. Sarkar P, Chakraborty K, Misra A, Shukla R, Swain SP. Pattern of psychotropic prescription in a tertiary care center: a critical analysis. Indian J Pharmacol. 2013;45(3):270–273. Christodoulou E, Kadoglou NP, Kostomitsopoulos N, Valsami G. Saffron: a natural product with potential pharmaceutical applications. J Pharm Pharmacol. 2015;67(12):1634–1649. Ríos JL, Recio MC, Giner RM, Máñez S. An update review of saffron and its active constituents. Phytother Res. 1996;10(3):189–193. Alonso GL, Salinas MR, Garuo J, Sanchez-Fernandez MA. Composition of crocins and picrocrocin from Spanish saffron (Crocus satvus L.). J Food Quality. 2000;24:219–233. Moshiri M, Vahabzadeh M, Hosseinzadeh H. Clinical applications of saffron (Crocus sativus) and its constituents: a review. Drug Res. 2014;65(6):287–295. Moosavi SM, Ahmadi M, Amini M, Vazirzadeh B. The effects of 40 and 80 mg hydro- alcoholic extract of Crocus sativus in the treatment of mild to moderate depression. J Mazandaran Univer Med Sci. 2014;24(113):47–53. Shahmansouri N, Farokhnia M, Abbasi SH, et al. A randomized, double-blind, clinical trial comparing the efficacy and safety of Crocus sativus L. with fluoxetine for improving mild to moderate depression in post percutaneous coronary intervention patients. J Affect Disord. 2014;155:216–222. Shemshian M, Sadeghi A, Kermani T, et al. Saffron (Crocus sativus) in the treatment of anxiety and depression: a double-blind, randomized and placebo-controlled trial. Clin Biochem. 2011;44(13):S118. Georgiadou G, Tarantilis PA, Pitsikas N. Effects of the active constituents of Crocus sativus L., crocins, in an animal model of obsessive-compulsive disorder. Neurosci Lett. 2012;528(1):27–30. Schmidt M, Betti G, Hensel A. Saffron in phytotherapy: pharmacology and clinical uses. Wien Med Wochenschr. 2007;157(13–14):315–319. Wang Y, Han T, Zhu Y, et al. Antidepressant properties of bioactive fractions from the extract of Crocus sativus L. J Nat Med. 2010;64(1):24–30. De Monte C, Carradori S, Chimenti P, et al. New insights into the biological properties of Crocus sativus L.: chemical modifications, human monoamine oxidases inhibition and molecular modeling studies. Eur J Med Chem. 2014;82:164–171. Palta P, Samuel LJ, Miller ER, Szanton SL. 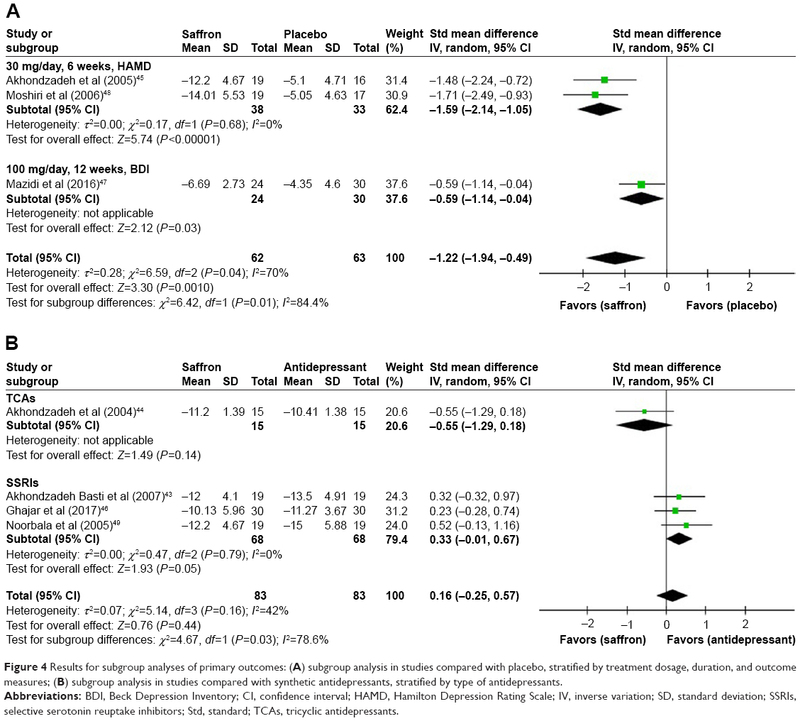 Depression and oxidative stress: results from a meta-analysis of observational studies. Psychosom Med. 2014;76(1):12–19. Asdaq SM, Inamdar MN. Potential of Crocus sativus (saffron) and its constituent, crocin, as hypolipidemic and antioxidant in rats. Appl Biochem Biotechnol. 2010;162(2):358–372. Poma A, Fontecchio G, Carlucci G, Chichiricco G. Anti-inflammatory properties of drugs from saffron crocus. Antiinflamm Antiallergy Agents Med Chem. 2012;11(1):37–51. Lopresti AL, Drummond PD. Saffron (Crocus sativus) for depression: a systematic review of clinical studies and examination of underlying antidepressant mechanisms of action. Hum Psychopharmacol. 2014;29(6):517–527. Ravindran AV, Balneaves LG, Faulkner G, et al. Canadian Network for Mood and Anxiety Treatments (CANMAT) 2016 clinical guidelines for the management of adults with major depressive disorder: Section 5. Complementary and alternative medicine treatments. Can J Psychiatry. 2016;61(9):576–587. American Psychiatric Association. Diagnostic and Statistical Manual of Mental Disorders. 3rd ed. Washington, DC: American Psychiatric Association; 1980. American Psychiatric Association. Diagnostic and Statistical Manual of Mental Disorders. The revision of 3rd ed. Washington, DC: American Psychiatric Association; 1987. American Psychiatric Association. Diagnostic and Statistical Manual of Mental Disorders. The revision of 4th ed. Washington, DC: American Psychiatric Association; 2000. World Health Organization (WHO). The Ninth Revision of the International Classification of Diseases and Related Health Problems. Geneva: World Health Organization; 1978. World Health Organization (WHO). The Tenth Revision of the International Classification of Diseases and Related Health Problems. Geneva: World Health Organization; 1992. Higgins JP, Green S. Cochrane Handbook for Systematic Reviews of Interventions, version 5.1.0. Chichester, UK: John Wiley & Sons; 2011. Zimmerman M, Martinez JH, Young D, Chelminski I, Dalrymple K. Severity classification on the Hamilton Depression Rating Scale. J Affect Disord. 2013;150(2):384–388. Beck AT, Steer RA. Beck depression Inventory Manual. New York: Guildford Press; 1993. Cipriani A, Zhou X, Del Giovane C, et al. Comparative efficacy and tolerability of antidepressants for major depressive disorder in children and adolescents: a network meta-analysis. Lancet. 2016;388(10047):881–890. Furukawa TA, Barbui C, Cipriani A, Brambilla P, Watanabe N. Imputing missing standard deviations in meta-analyses can provide accurate results. J Clin Epidemiol. 2006;59(1):7–10. Moher D, Liberati A, Tetzlaff J, Altman DG; The PRISMA Group. Preferred Reporting Items for Systematic Reviews and Meta-Analyses: the PRISMA statement. PLoS Med. 2009;6(7):e1000097. Akhondzadeh Basti A, Moshiri E, Noorbala AA, Jamshidi AH, Abbasi SH, Akhondzadeh S. Comparison of petal of Crocus sativus L. and fluoxetine in the treatment of depressed outpatients: a pilot double-blind randomized trial. Prog Neuropsychopharmacol Biol Psychiatry. 2007;31(2):439–442. Akhondzadeh S, Fallah-Pour H, Afkham K, Jamshidi AH, Khalighi-Cigaroudi F. Comparison of Crocus sativus L. and imipramine in the treatment of mild to moderate depression: a pilot double-blind randomized trial [ISRCTN45683816]. BMC Complement Altern Med. 2004;4:12. Akhondzadeh S, Tahmacebi-Pour N, Noorbala AA, et al. Crocus sativus L. in the treatment of mild to moderate depression: a double-blind, randomized and placebo-controlled trial. Phytother Res. 2005;19(2):148–151. Ghajar A, Neishabouri SM, Velayati N, et al. Crocus sativus L. versus citalopram in the treatment of major depressive disorder with anxious distress: a double-blind, controlled clinical trial. Pharmacopsychiatry. 2017;50:152–160. Mazidi M, Shemshian M, Mousavi SH, et al. A double-blind, randomized and placebo-controlled trial of saffron (Crocus sativus L.) in the treatment of anxiety and depression. J Complement Integr Med. 2016;13(2):195–199. Moshiri E, Basti AA, Noorbala AA, et al. Crocus sativus L. (petal) in the treatment of mild-to-moderate depression: a double-blind, randomized and placebo-controlled trial. Phytomedicine. 2006;13(9–10):607–611. Noorbala AA, Akhondzadeh S, Tahmacebi-Pour N, Jamshidi AH. Hydro-alcoholic extract of Crocus sativus L. versus fluoxetine in the treatment of mild to moderate depression: a double-blind, randomized pilot trial. J Ethnopharmacol. 2005;97(2):281–284. Hausenblas HA, Saha D, Dubyak PJ, Anton SD. Saffron (Crocus sativus L.) and major depressive disorder: a meta-analysis of randomized clinical trials. J Integr Med. 2013;11(6):377–383. Okumura Y, Ichikura K. Efficacy and acceptability of group cognitive behavioral therapy for depression: a systematic review and meta-analysis. J Affect Disord. 2014;164:155–164. Akhondzadeh Basti A, Choreishi SA, Noorbala AA, Akhondzadeh SH, Rezazadeh S. Petal and stigma of Crocus sativus L. in the treatment of depression: a pilot double-blind randomized trial. J Med Plants. 2008;7:29–36. Mohamadpour AH, Ayati Z, Parizadeh MR, Rajbai O, Hosseinzadeh H. Safety evaluation of crocin (a constituent of saffron) tablets in healthy volunteers. Iran J Basic Med Sci. 2013;16(1):39–46. Kashani L, Raisi F, Saroukhani S, et al. Saffron for treatment of fluoxetine-induced sexual dysfunction in women: randomized double-blind placebo-controlled study. Hum Psychopharmacol. 2013;28(1):54–60. Mansoori P, Akhondzadeh S, Raisi F, et al. A randomized, double-blind, placebo-controlled study of safety of the adjunctive saffron on sexual dysfunction induced by a selective serotonin reuptake inhibitor. J Med Plants. 2011;10(37):121–130. Modabbernia A, Sohrabi H, Nasehi AA, et al. Effect of saffron on fluoxetine-induced sexual impairment in men: randomized double-blind placebo-controlled trial. Psychopharmacology. 2012;223(4):381–388.